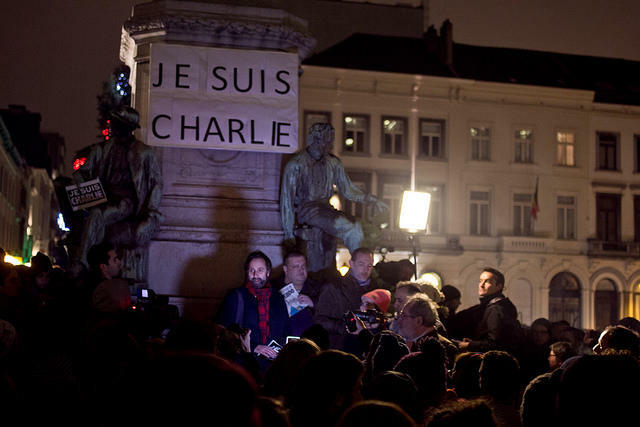 Demonstrators in Luxembourg assembled with signs reading "Je suis Charlie," or "I am Charlie," to show their support for Charlie Hebdo. Moussa Elbayoumy is chairman for the Kansas branch of CAIR. He says that while his organization remains cautious, they’re relieved by the media response surrounding the attack so far. "We have had a long standing concern that the media is very quick to label something as ‘Islamic’ or [will make] references to people that wanted to be martyrs," Elbayoumy said. "But in this particular case, I think people have been more restrained." CAIR’s national branch condemned the shooting mere hours afterwards, offering condolences to the affected families. Robert Siegel talks to Patrick Weil, professor and senior research fellow at the French National Research Center in the University of Paris 1, Pantheon-Sorbonne, about how the attack on the satirical publication, Charlie Hebdo, relates to ongoing political tensions in France.